If we are primarily interested in assessing component dynamic response, then shake table tests may not be the most cost and technical (due to very limited causality) solution. Dynamic tests (as performed by our group) should be conducted if one seeks to assess rate effects , however this testing paradigm does not account for the interaction of the component with the system. If the dynamic interaction of a component with the surrounding system is to be investigated, then Real Time Hybrid Simulation (RTHS) is a far better alternative to component shake table tests. The objective of this investigation was to perform a RTHS of a reinforced concrete frame which has non-ductile (insufficient shear reinforcement) columns at the base, and to compare RTHS results with the ones obtained from a shake table test by Ghannoum (2007). The numerical model is highly nonlinear (steel and concrete), has flexibility based, zero length/section elements and fiber sections resulting in 402 degrees of freedom. Whereas our laboratory had a real time implementaiton of OpenSees, this code was deemed unable to drive our simulation, and we used a newly developed code (by our group) Mercury successfully. If you are not familiar with the concept of hybrid simulaiton, or real time hybrid simulaiton, the following video (put togther when we were a NEES center) describes this novel testing paradigm (you should click on the play key bottom right). OpenSees has been used for Pseudo Dynamic (PsD) simulations of R/C frames, and Simulink has been used for simple (few degrees of freedom) nonlinear models. To the best of our knowledge, there is no report of a RTHS of a structure as complex as the one we report here in either Civi, Mechanical or Aerospace Engineering. Saouma, V., Haussmann, Kang, D.H, Ghannoum, W., Polkinghorne, K.: 2010, On Real Time Hybrid Simulation, Shake Table Tests, and Numerical Modeling; Systems vs Components Submitted for publication. We succeeded in performing the RTHS of a R/C frame with non-ductile column. Major step toward meeting ultimate NEES objective of NEES integrated computer simulation and physical testing. Tests were made possible through the collaboration of Prof. W. Ghannoum (Univ. 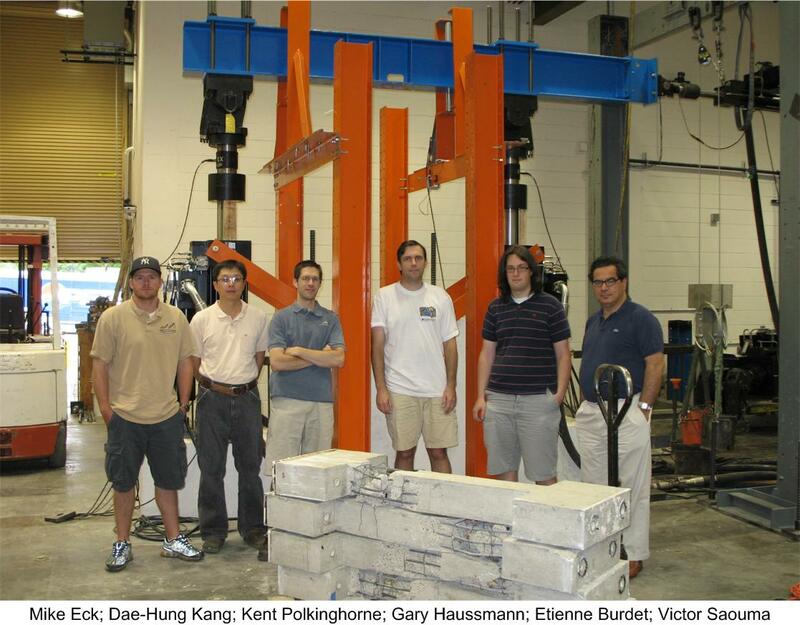 of Texas, Austin) who designed the pedestal, structural components, and helped interpret the results. Control algorithm was written by Dr. Gary Haussmann, tests were run by Kent Polinghorne and Michael Eck. Prof. Saouma was overseeing the project. Funding was from the State of Colorado.